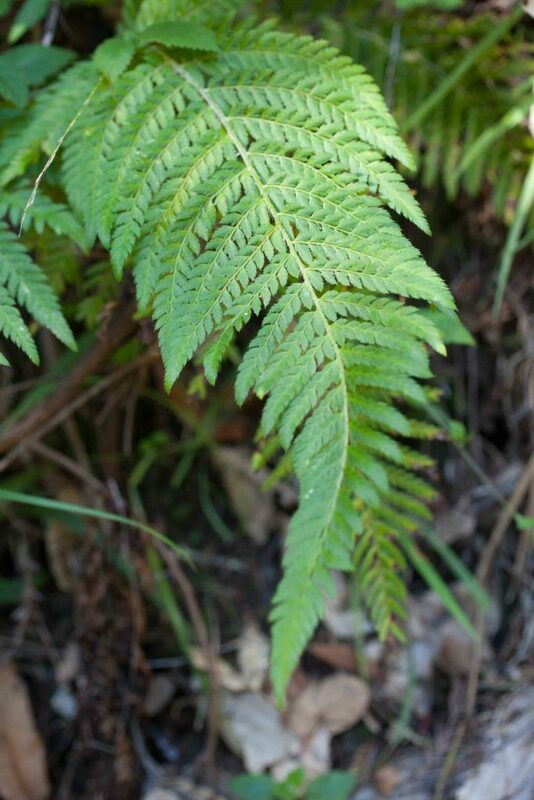 This is one of the largest ferns, favouring damp conditions and generally found near streams or seeps. 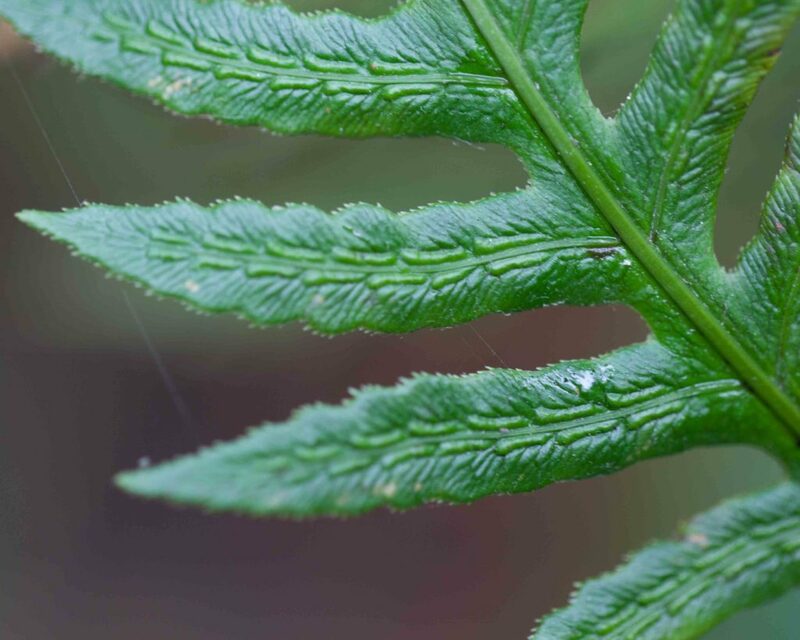 The pinnae are clearly separated and pinnules are each pointed and very finely serrated. 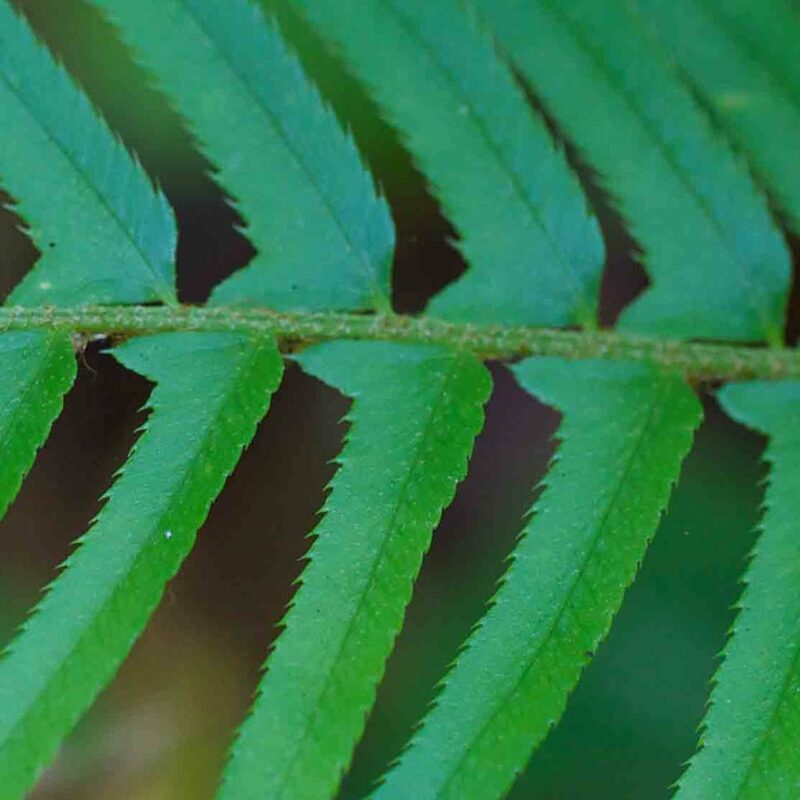 The common name derives from the neat lines created by the oblong sori and which are visible on both the upper andlower surfaces of each pinnule. 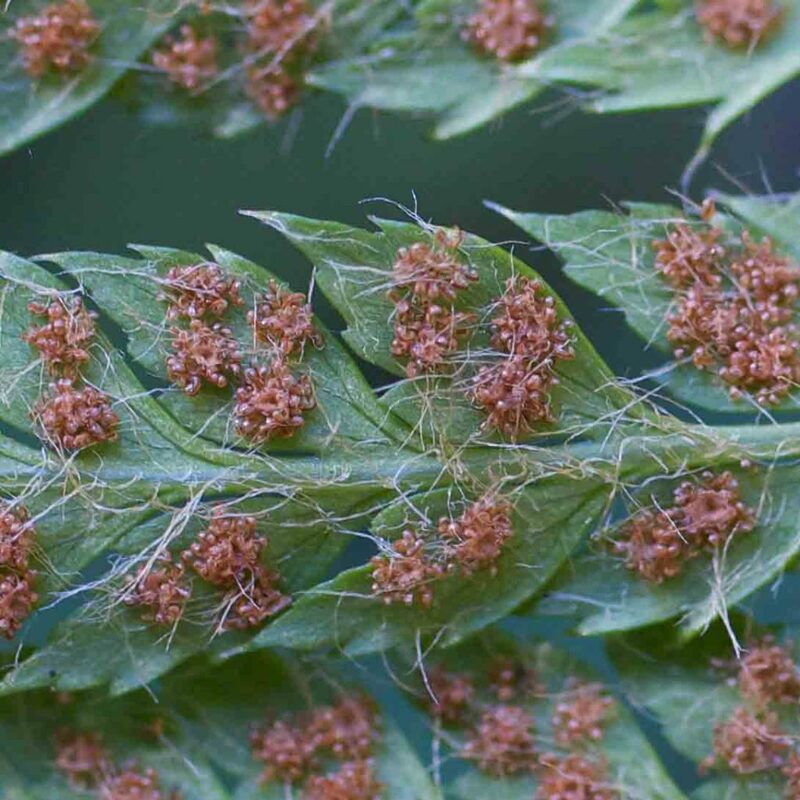 As the sporangia mature, the indusium opens lengthways like a lid so as to reveal the sporangia underneath. 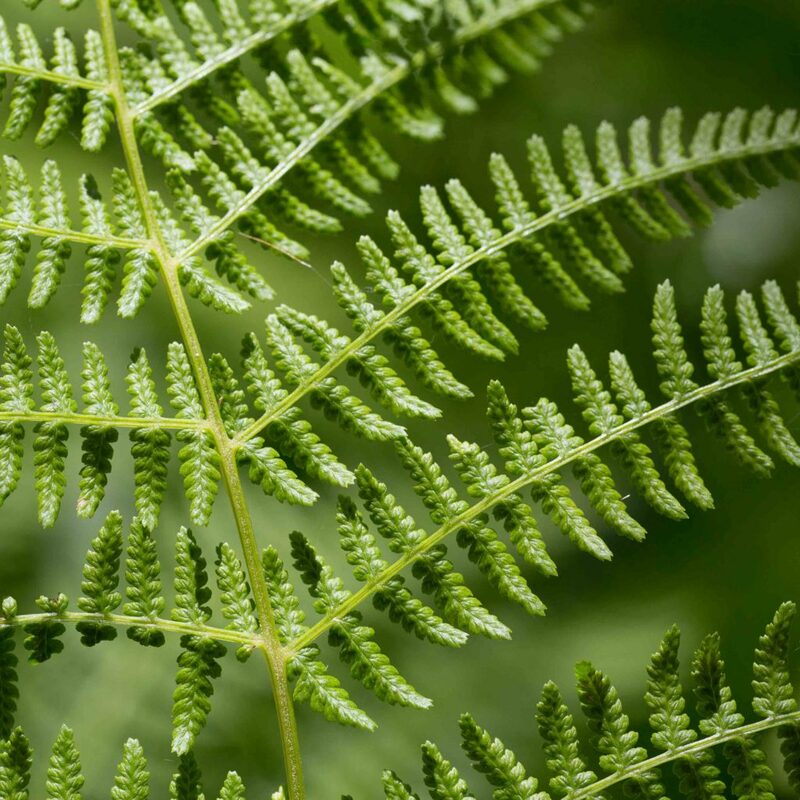 The fronds are at first sight similar to those of Wood Fern (Dryopteris arguta) but Bracken Fern has a distinct stem (typically about 1 m tall) with fronds branching off it whereas the fronds of Wood Fern all arise directly from the fern’s base. 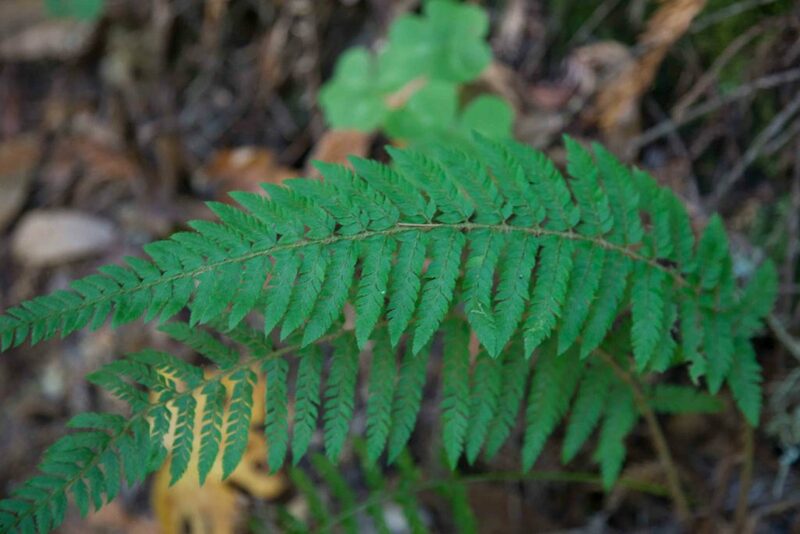 Also unlike Wood Fern,, it is deciduous. 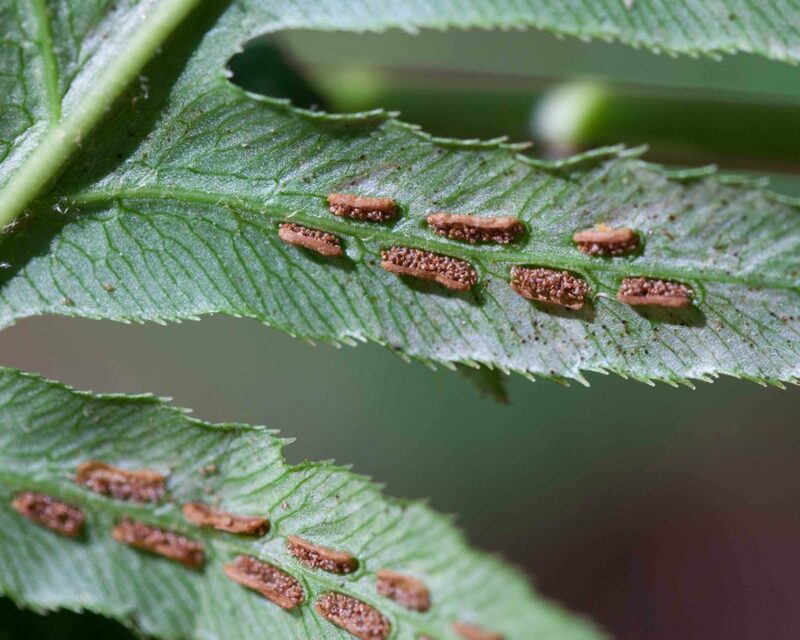 Sori are concentrated around the margins of the pinnules, more or less covered by the false indusium. 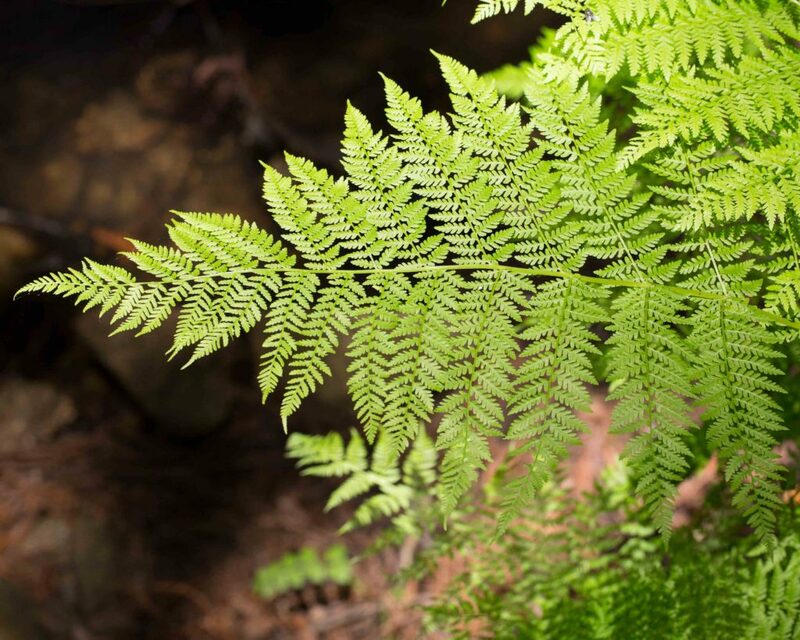 This fern tends to prefer open areas where it can spread extensively. 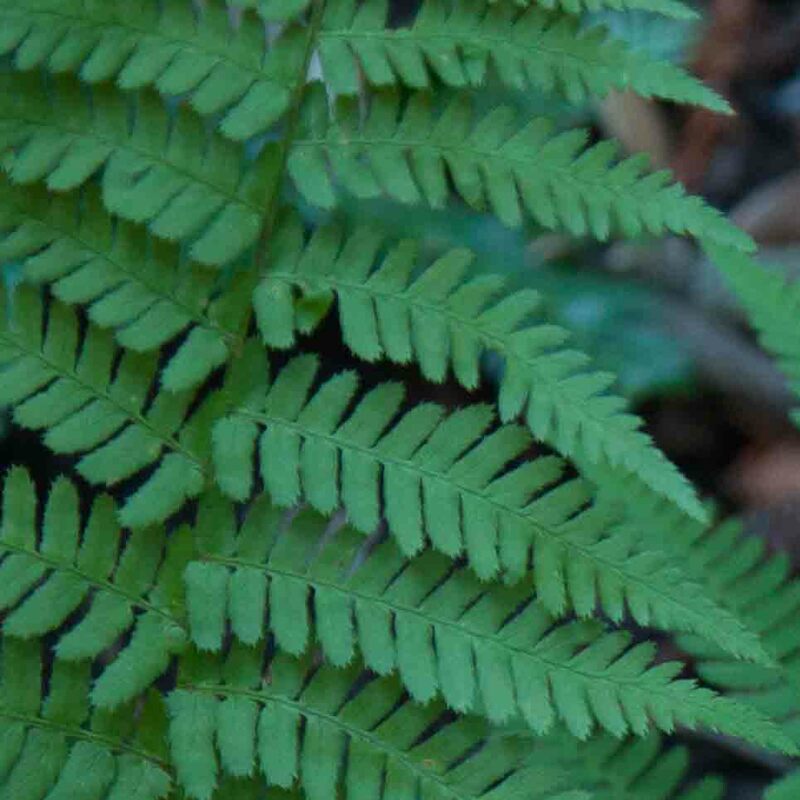 This is certainly the commonest evergreen fern to be found in oak woodlands, each plant producing several fronds from its base (so differentiating it from Western Bracken Fern (Pteridium aquilinum) which has a distinct stem with fronds branching from it). 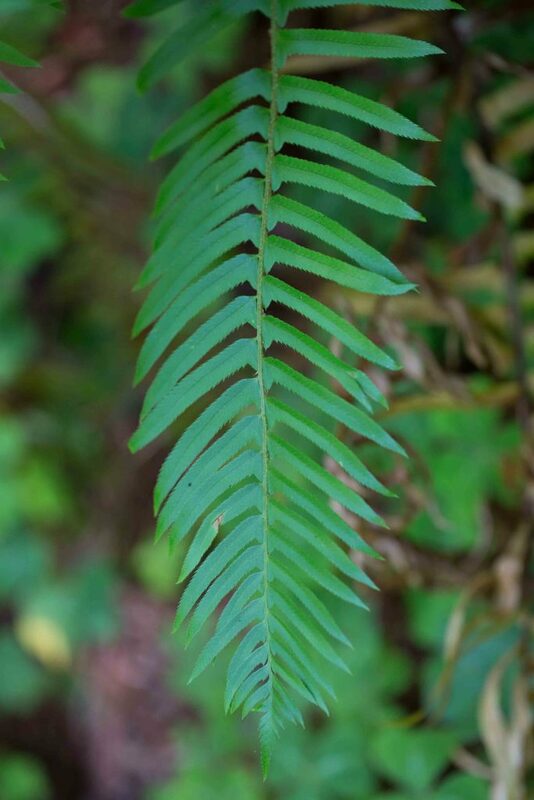 The fronds are lanceolate but the pinnules tend to be rounded with all of the veins ending in spine-tipped teeth. 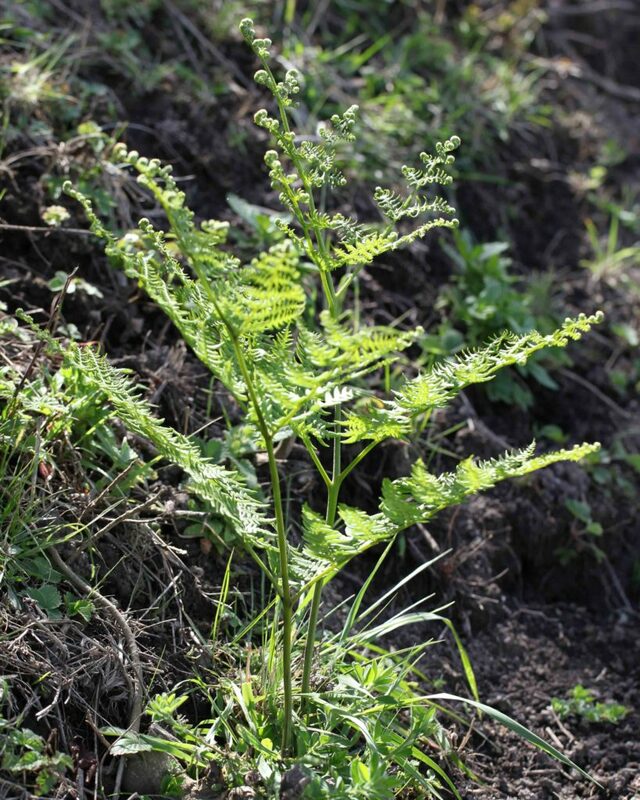 The sori are covered by a roundish or kidney-shaped indusium. 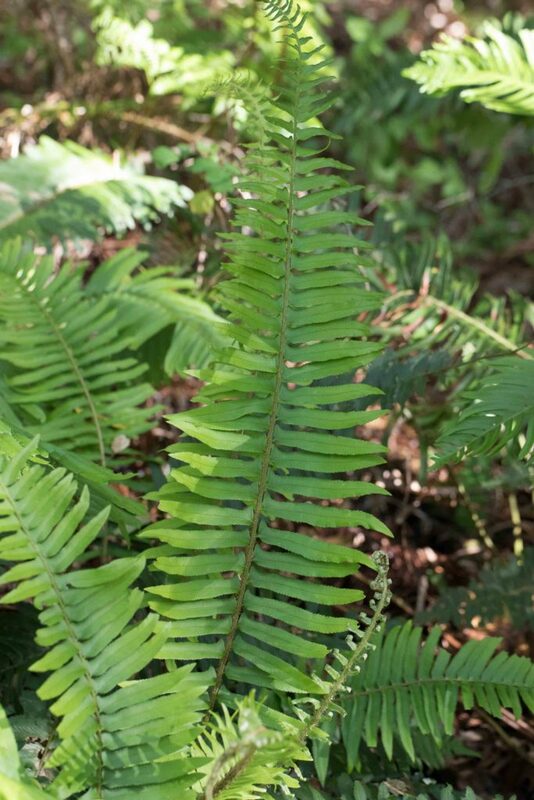 The fronds feel a little tougher and firmer and are less broadly triangular than those of Lady Fern (Athyrium filix-femina) with which it could be confused. 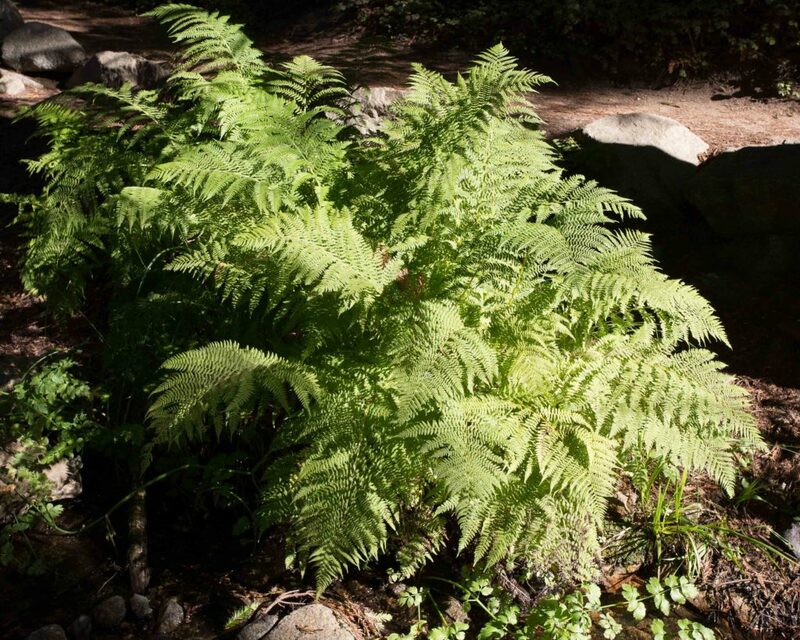 This is one of the most commonly found ferns, in oak woodland and, especially, in redwood forests. 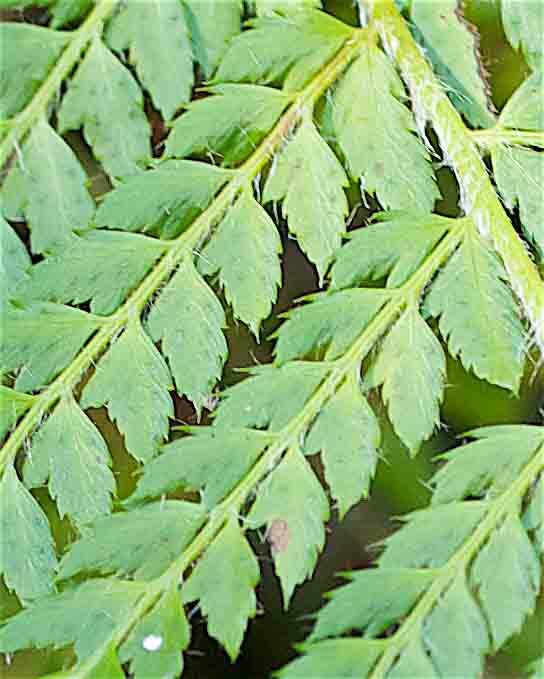 Each plant may produce many shiny, deep green fronds with slender pinnae which have serrated margins. The broadened base of the pinnae is said to resemble a sword’s hilt. 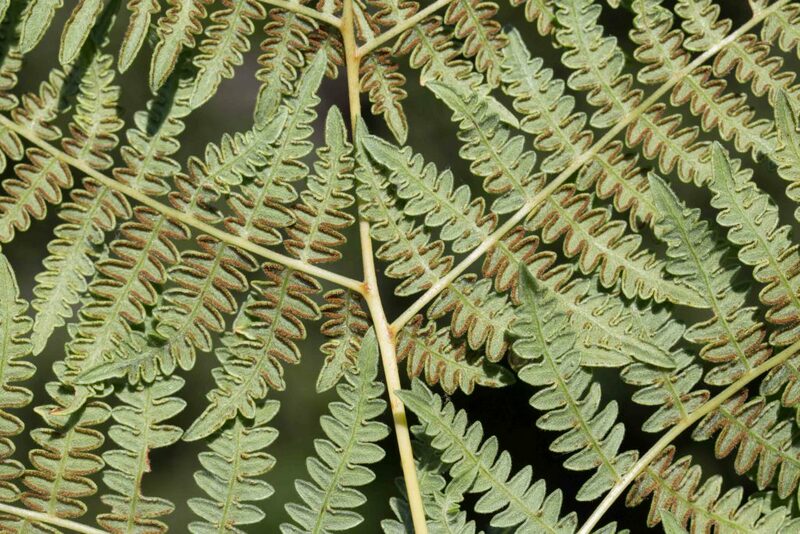 The axis of the frond (the “rachis”) has brown scales. The sori are round. 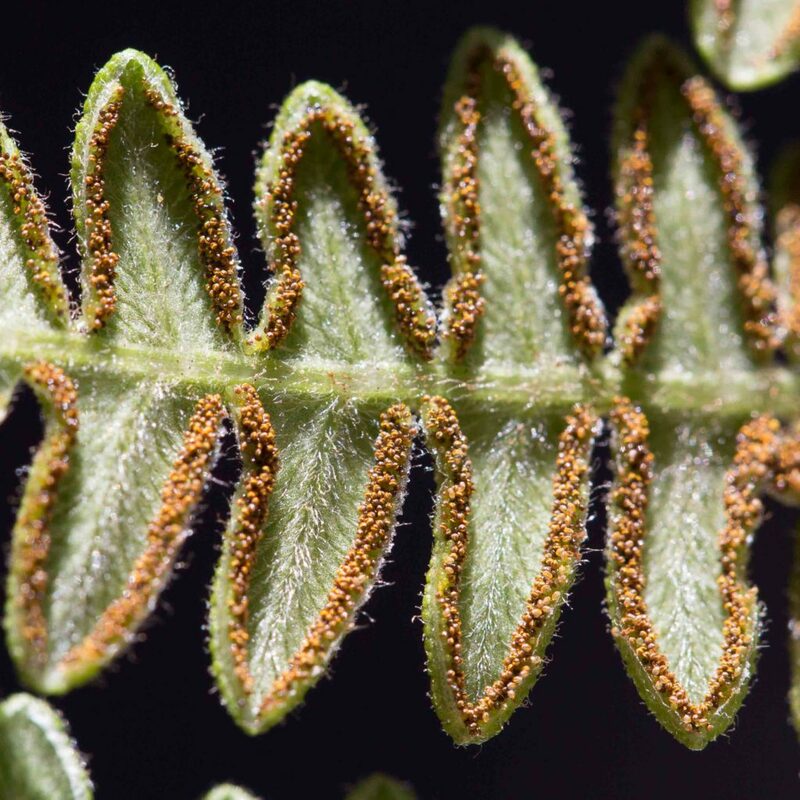 Like other Polystichum, indusia, if present, have marginal hairs and are “peltate”, i.e. 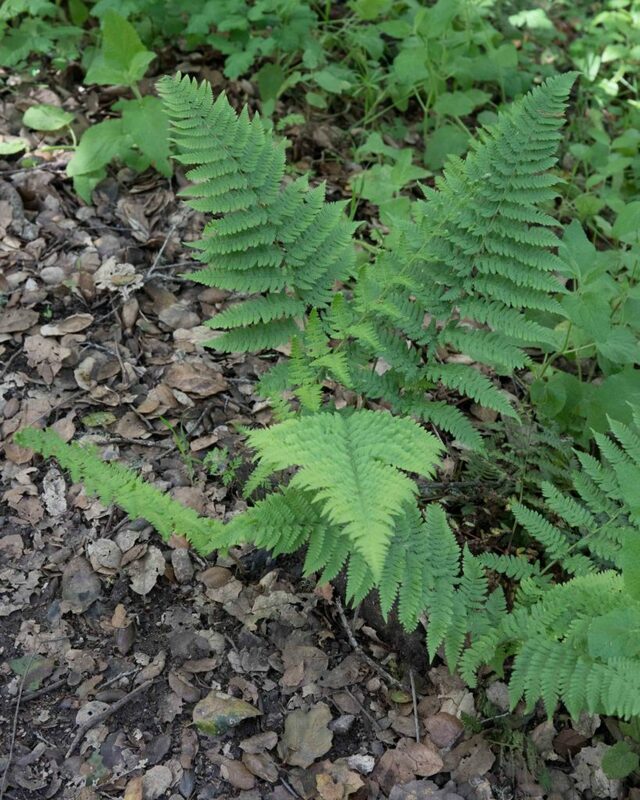 with a stem attached to the lower surface like a parasol. 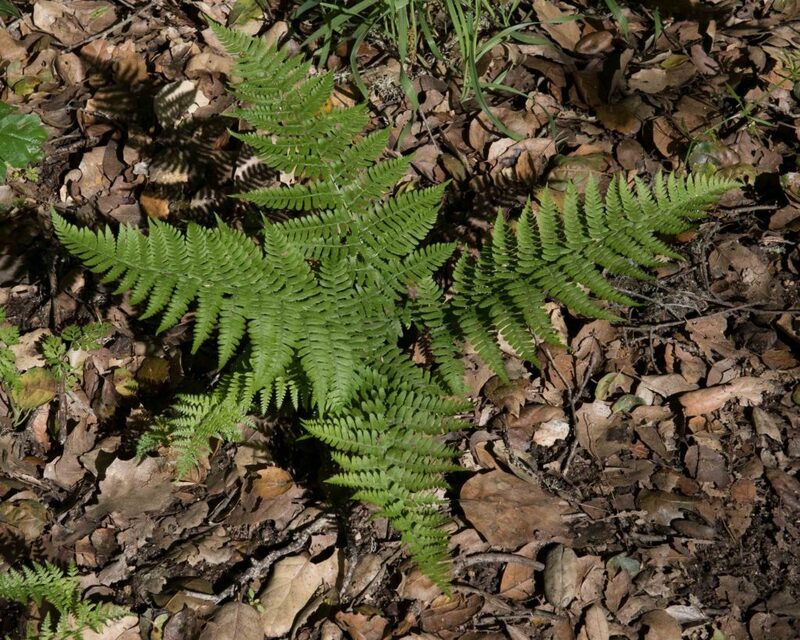 This is similar to Dudley’s Sword Fern (Polystichum dudleyi) but with some subtle differences. The base of the pinnules is clearly tapered and without lobes. 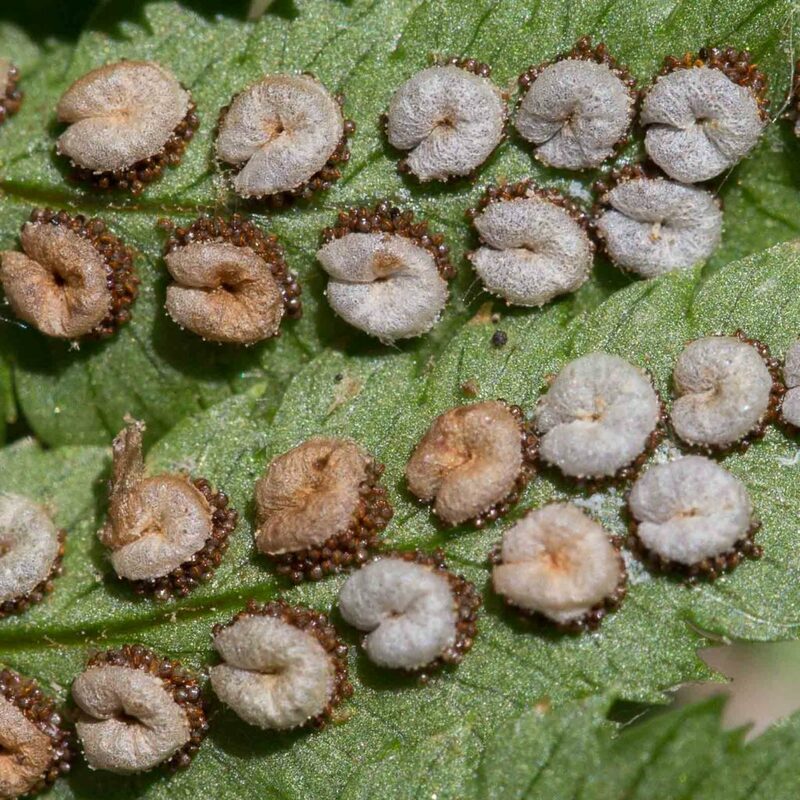 Multiple sori on each pinnule appear to be common. 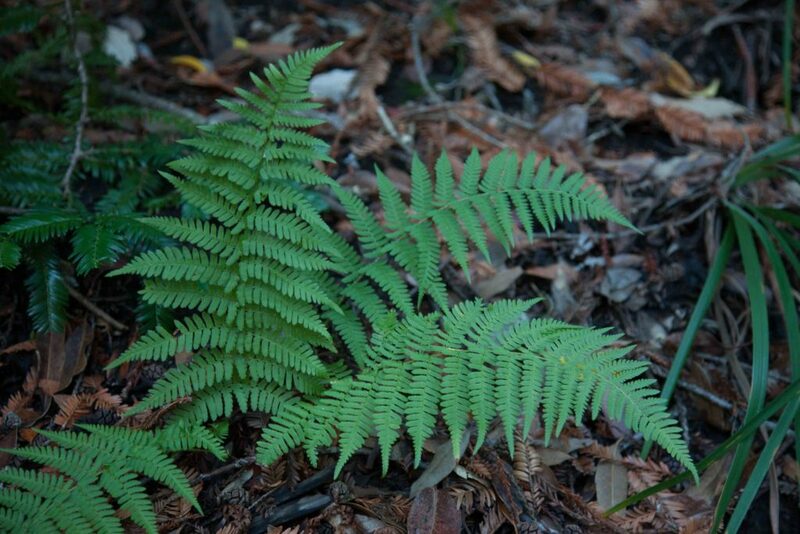 Indusia, if present, are, as with Dudley’s Sword Fern, delicate and with hairy margins. 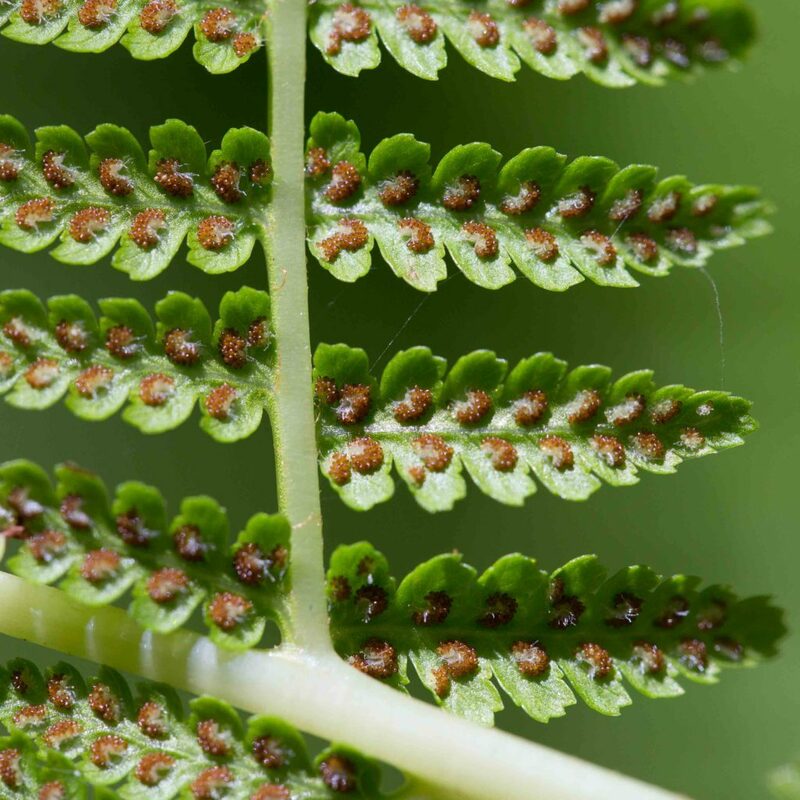 The fronds are much softer than Sword Fern (Polystichum munitum). 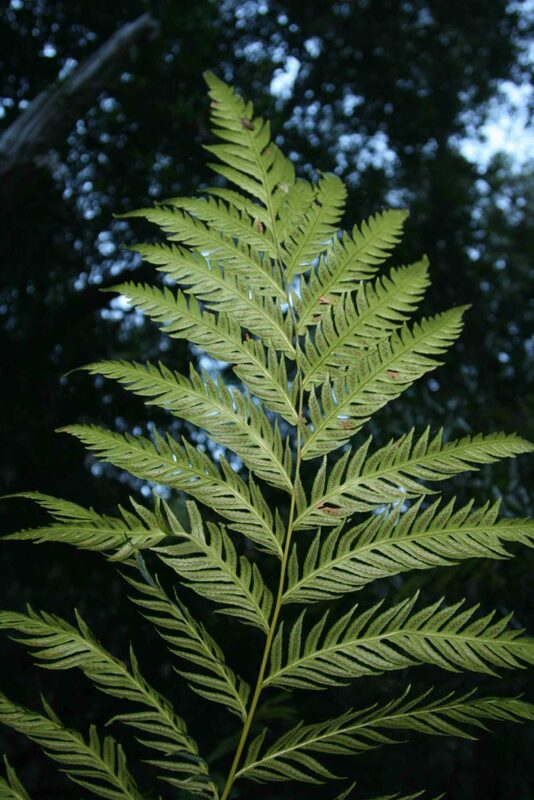 The species is thought to be a sterile hybrid between P. munitum and P. dudleyi. 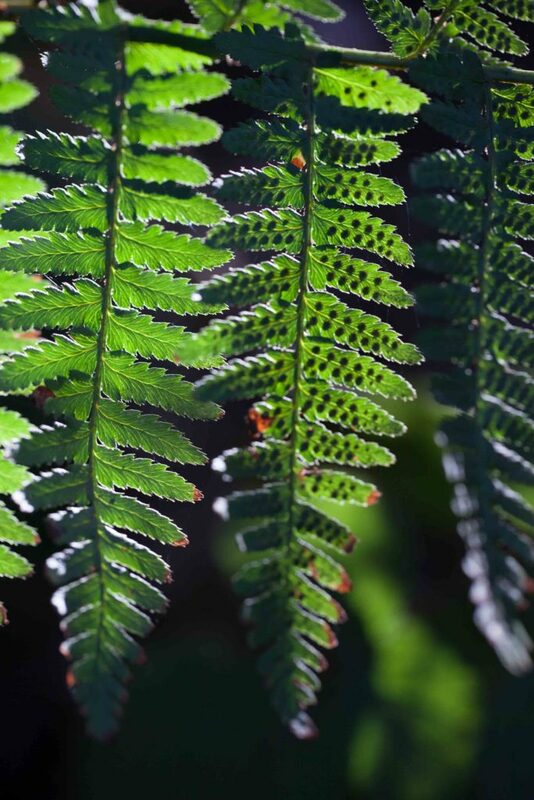 This produces several arching fronds, soft to the touch, unlike Sword Fern (Polystichum munitum). Pinnules are abruptly tapered at their base, often lobed and ore or less divided or serrate to pinnately cut. 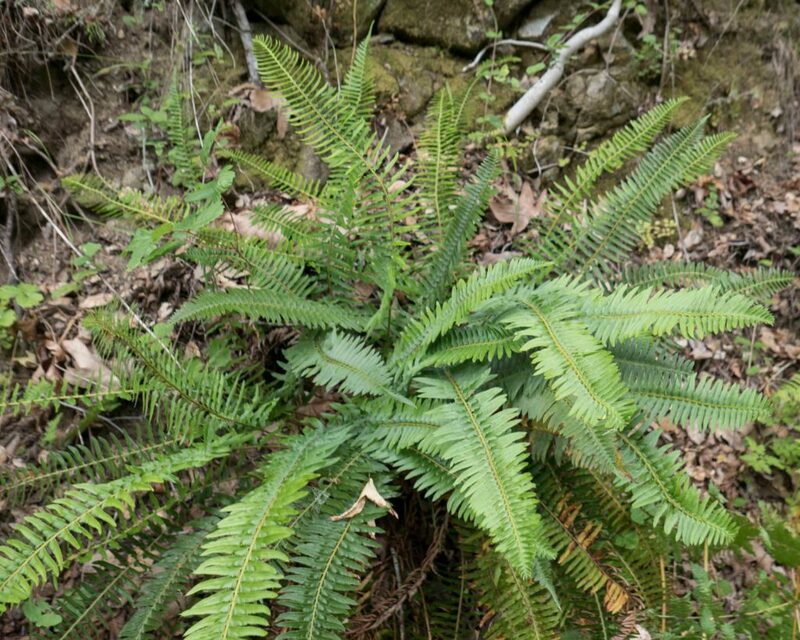 Indusia, if present, are delicate and with hairy margins. 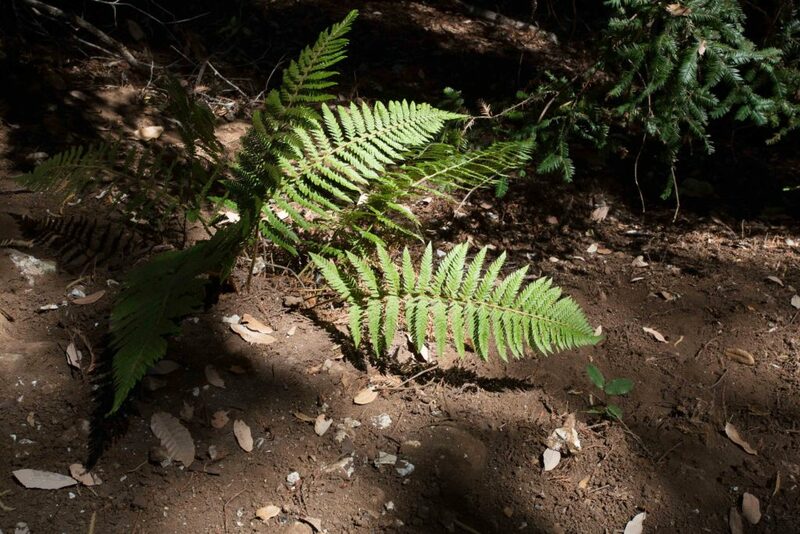 Found in redwood and mixed evergreen forests. 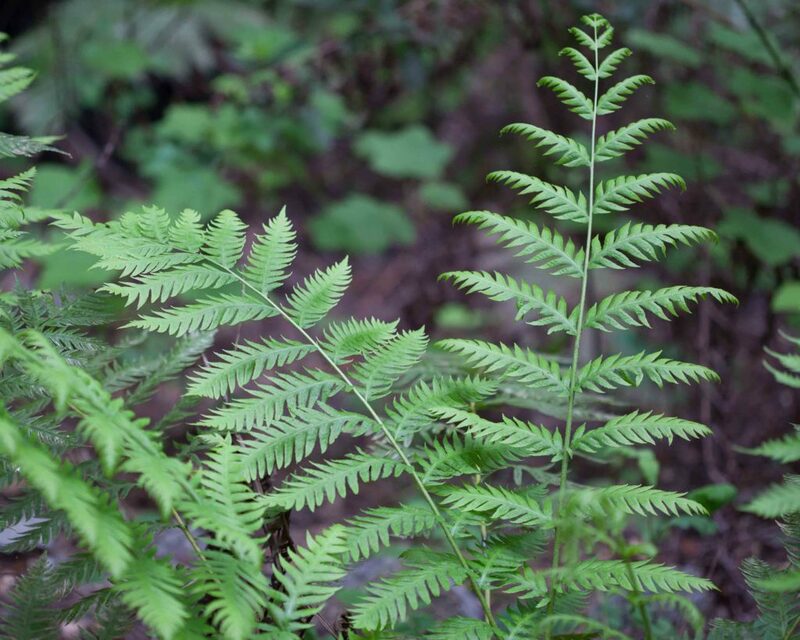 This is easily mistaken for Wood Fern (Dryopteris arguta) but its fronds are significantly larger and more broadly triangular, noticeably softer to the touch and generally paler in color. The lower 2–4 pinnae are much shorter than those immediately above. Sori may be round, oblong or J-shaped. Indusia, if present, will be similarly shaped, attached on the inner side of the sori, often with hairy margins. Found in meadows and streambanks.